There are a lot of different camera brands around and even more types of RAW image formats which cannot be universally opened or edited. With Adobe DNG Converter, you have a freeware tool directly from Adobe which supports around 400 different types of image formats from digital cameras, from the low-end of the spectrum to high-end equipment. It goes without saying that Adobe DNG Converter supports RAW images created by Canon, Nikon, Olympus and Sony but also supports those created by RAW shooting on Samsung, Panasonic, Sigma, Ricoh and Leica cameras. The technology inside of the Adobe DNG Converter is actually the same that is available from the well-known image editing program called Adobe Lightroom. Version 11.2.1 is a freeware program which does not have restrictions and it's free so it doesn't cost anything. 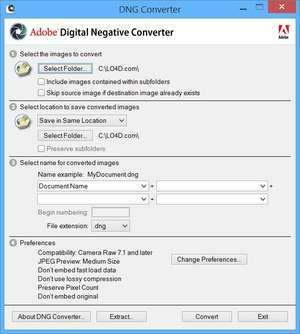 For security reasons, you should also check out the Adobe DNG Converter download at LO4D.com which includes virus and malware tests. Additional screenshots of this application download may be available, too.